840 yards of stockinette complete. Hello again everyone! Analog week is over, and I’m back. Normally, I’m not into stunts or fasts or tests of endurance, but going analog for a week was pretty awesome. I didn’t go 100% analog: there was a day where I went online to apply for a job whose deadline was within analog week, and I took and made calls on my iPhone. But those things actually made the week harder, not easier, to get through. Day one, I weirded out a little at not being able to tell the world every single little thing I was thinking. By day two, that wore off, and I was really enjoying not having to mentally juggle more than two tasks at once: knitting + reading. Reading + coffee. Knitting + writing. My new turntable and my old tuner won’t talk, so the only music I heard was music played in shops. Sometimes that was lonely, but mostly it was soothing. Day three I applied for a job. Ugh. Ugh. Ugh. Job applications represent the worst of the digital world, if you ask me. That experience made me keep the analog going through the weekend. Analog week did not turn into a massive project-a-thon. I am sometimes guilty of making myself miserable completing a project just to have it completed. By some miracle, I did not do that to myself this time. I worked on a story I began 10 years ago, but didn’t race to finish it. 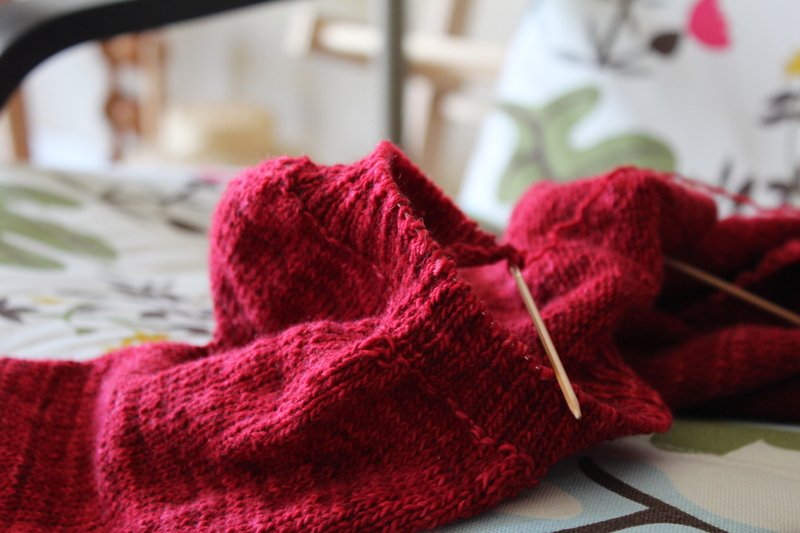 I made progress on my Holla Back Tank and Red (above), but did not lose sleep in an attempt to finish either project. I read a book, but did not attempt to read every book I’ve ever wanted to read. I did what I felt like doing, and tried to focus on enjoying each activity in the moment. The biggest eye-opener was just how overburdened I’d been these past few weeks. I want to keep from getting to that point again, but without shutting down my computer and phone for a week, I’m not sure how. Recommendations? I am usually not able to make myself do this, but I seem to do better when I limit my internet time to half-an-hour to an hour in the morning and half-an-hour to an hour in the evening. I miss you too! A time limit sounds like a good plan…I should try that!